What is a Screw Jack? Explain its working principle. Screw jacks are used to lift, hold and position the load. They are suitable for a variety of applications. Screw jacks are also known as 'Jack screw'. They convert rotational motion into linear motion. 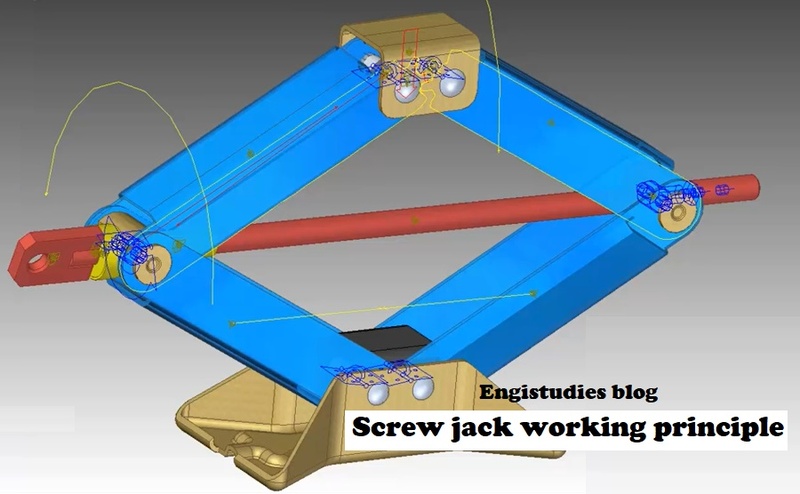 The principle on which screw jack operates is very much similar to that of an inclined plane. If we consider a single pitch of its threads then we can apply the following equation of inclined plane on it. Where a is the helix angle formed, P is the pitch of the thread and mean diameter is taken as'd'. Translating- in this, the lead screw travels linearly. Translating key- in this working is the same as the above variant, but the lead screw is keyed to ensure that it will not rotate. Rotating - in this lead screw rotates. Where r and l is the length of the jack handle and lead of the screw respectively.